Beginning with the class of 2001, all students who intend to graduate from Kennett High School shall undertake and complete a Graduation Project which meets the standards and provisions stated by the Pennsylvania State Board of Education and the Kennett Consolidated School District Board of Directors. It is very important that our students have a complete and thorough understanding of the importance of the project and seriousness with which our faculty and administration view the requirement. The purpose of the required project is to give you, the student, an opportunity to demonstrate your ability to apply various skills and demonstrate what you have learned.You will choose your topic of interest and work with an assigned faculty member or project mentor. Your advisory teacher will guide you in the process and you will be assigned an evaluator along with the date and time of evaluation (which will take place during final exams) at the beginning of your junior year. 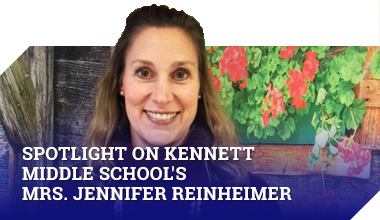 To meet the requirements of the Pennsylvania Department of Education Chapter Four Regulations, the Kennett Consolidated School District and Kennett High School have implemented a Graduation Project. This project requires the interaction of the students, staff, and various individuals from the community. The administration and faculty are genuinely committed to a process that facilitates the successful completion of this project. The Graduation Project process begins with integrated skill building embedded in the curriculum starting in the ninth grade year. The project will be comprehensive in nature, and the process will encompass various components including a reflective essay, a career exploration, community service, and a presentation. Our goal is to challenge students to become life-long learners, responsible citizens, and productive members of their community. The Graduation Project provides the opportunity for students to demonstrate competencies in oral and written communication, information gathering/research skills, and technology utilization. The purpose of the project is to ensure that students are able to apply, analyze, synthesize, and evaluate information and then communicate the significant knowledge and understanding they have acquired. WRITTEN PRESENTATION(S): The student will write a 500-word reflective essay on the career exploration and the community service experience. CAREER PATH INQUIRY: The student will investigate and document the career possibilities related to the subject being studied. COMMUNITY SERVICE: The student will participate in a project that provides valuable service to the community, a church or school or participate in a charitable endeavor sponsored by the business in which the student interns. ORAL/MULTIMEDIA PRESENTATION: The student will provide a culminating presentation of his or her experience. This will be presented before the evaluation panel during final exams in the 11th grade.